Markets have seen a sharp increase in volatility in recent weeks, with the S&P 500 experiencing its worst December month since 1931. But, looking back at the history, the total lack of volatility in 2017 was more exceptional than the current market swings. The above graph shows the realized volatility of the S&P 500 Index since 1960. There are a number of observations about the ‘behavior’ of volatility on stock markets that are worth noting. 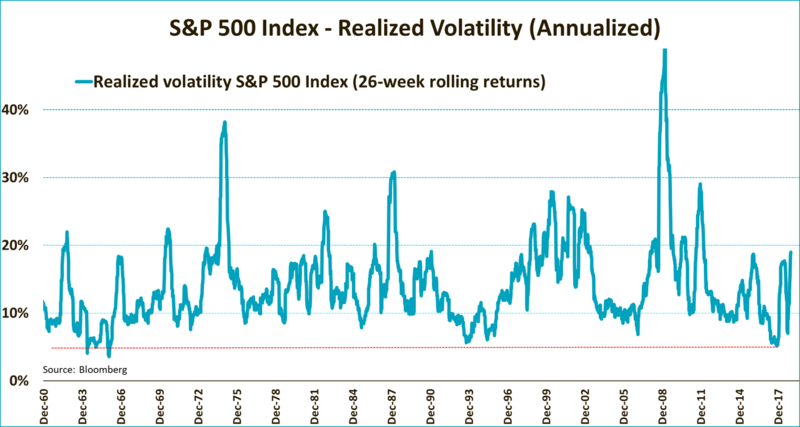 First: spikes in volatility occur from time to time and in a significant number of cases, they can’t be directly related to a bear market or recession. The most recent example was the period from the end of 2015 to the beginning of 2016, in which realized volatility rose to the levels seen today and the MSCI World Index lost 19% (not an official bear market and not followed by a recession). After bottomed in February 2016, the MSCI World Index gained a whopping 54% between then and the end of October last year. Second, although periods of high market volatility always feel a bit like the world is ending, the sense of despair this time could be heightened by the fact that until recently, market volatility was extremely low. As the red dotted line shows, realized volatility fell to a historical low of just 5.2% at the end of 2017. We have to go back over 50 years – to the beginning of 1966 – to find even lower levels of volatility. Moreover, at 5%, this level of risk is similar to that for investing in government bonds. In 2017, stocks provided above-average returns at well-below-average levels of risk. So 2017 was the outlier, not 2018. If we look at implied volatility – measured in the case of the S&P 500 by the well-known VIX index – a similar picture emerges. Despite rising to just above 15 several times in 2017, the VIX remained well below that for most of the year. For comparison: the average level of the VIX index since inception is 19. A third observation is that, prior to the previous two big bear markets (2000 and 2008), implied volatility fell to very low levels in several consecutive years. Again, it is 2017 that stands out on account of the very low volatility. In the years preceding 2017, volatility occasionally spiked above 25, without this signaling a bear market or recession. In addition, if we look at the behavior of stock markets during periods of turbulence, the picture is anything but extreme. 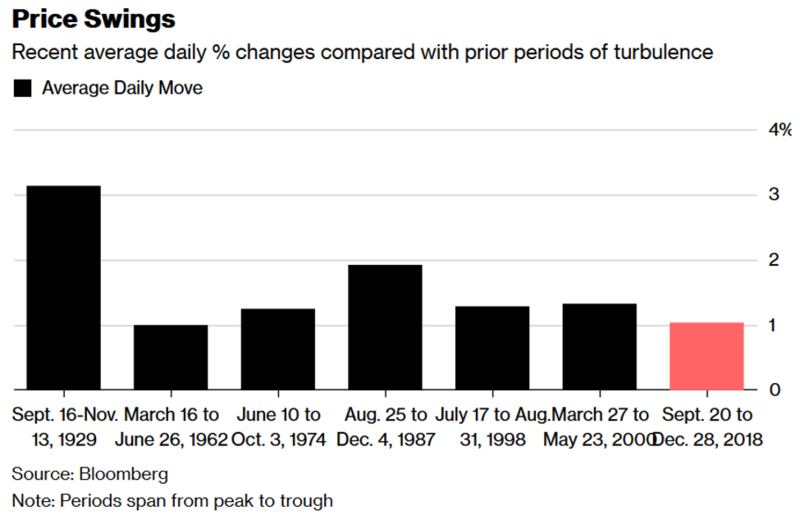 The Bloomberg graph below shows the average movements per day during previous periods of high volatility on the markets (barring the big bear markets). It suggests that the current daily price movements are relatively limited compared with those during previous periods of market stress. 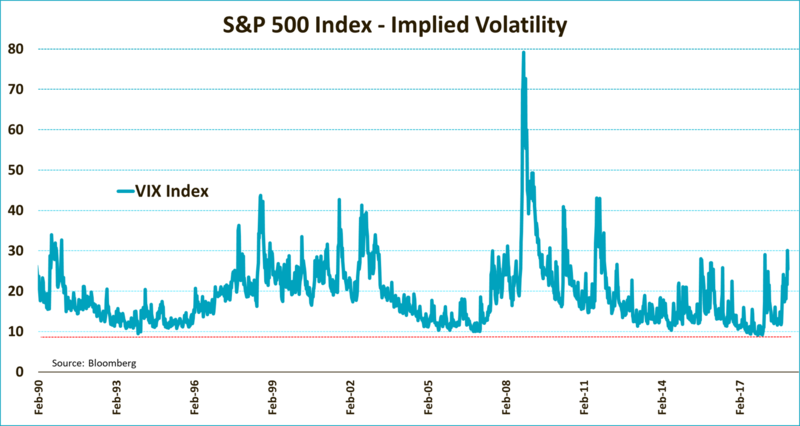 Dealing with spikes in volatility is perhaps the most challenging aspect of investing. Whatever the reason for turbulence, it never feels good. In these periods, it may be worth bearing the history of market behavior in mind, as this tells us that such periods do occur from time to time and are not necessarily followed by bear markets or recessions. Obviously, it isn’t enough to look at the history alone. But, as we have said several times in recent weeks, we believe that the future for stock markets doesn’t really look that gloomy.